The weather is dreadful today but things are not slowing down here at Smokey Ridge Apiaries. This year Smokey Ridge Apiaries have sold about 300 nucs and 250 packages, which roughly translates to just over 4 million bees. Pictured below are the few nucs that were left Saturday morning. There were several more rows like this on Friday, but they sold quickly as loyal customers dropped by in a steady stream starting Friday. 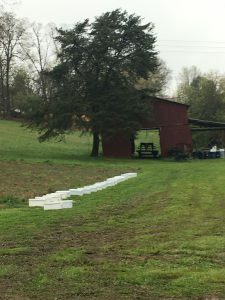 Smokey Ridge Apiaries’s Nuc store opened again Saturday morning at 6:30am and four hours later there had hardly been a pause. Nuc installation advice: In Saturday’s cold weather, Coley recommended waiting to install til it warms up. Until then, place your nuc on top of the hive where you plan to install leaving the small hole on the nuc open. When there’s less threat of a freeze, Coley recommends removing 5 frames from the super you are putting them into and replacing them with the frames from your new nuc. If you have drawn comb or honey on your old frames then move those frames to the outside and put your new frames in the middle. Package installation advise: Coley’s adopted a new method this year. Rather than placing queen on top of the frames and shaking the package on top of her, he recommends hanging the queen between the frames and removing enough frames from the super to fit the package box into the hive body where you are installing them. The next day you will remove the package container and with it any dead bees that you may find in the bottom of the box (rather than dumping dead bees into your hive). If there are still live bees in the box when you go back the next day, you can set the package in front of the hive so those bees will find their way in. For new beekeepers, Coley’s help through the ups and downs of the first years is indispensable. As she purchased a new nuc, Crystal explained how Coley sold her her first nuc last year and did everything he could to ensure her success as a first-year beekeeper. He provided continuous support through her first year, providing a new queen when needed, answering questions and offering his expertise and advice when she needed it. Like many beekeepers in East Tennessee, Crystal sustained loses this winter. Her losses were in part due to yellow jacket attacks that lowered her colony size going into winter. Smaller colonies simply can’t produce the heat they need to survive the cold winter. Because of his untiring assistance, she came back to buy more bees from him this year. She asked what to do if she has more yellow jackets this year. Coley’s adivse? Use an old coke bottle, put banana peels and apple cider vinegar in it. Make a hole about half way up and hang the bottle in a tree near your hives about 5-7 feet up. This will detract yellow jackets from your hives. Expert beekeepers also return to Coley every year because they know they can trust him. Michael, employee of the UT Apiary Division, also came by to pick up two nucs he purchased from Coley. Michael’s knowledge of the problems facing bees nationwide is extensive. In addition to many other services he provides, he participates in Sentinel Apiaries. These services act like sentinels that evaluate hives and alert surrounding beekeepers of escalating problems in their area. Like Crystal, Michael buys his bees from Coley because he knows he can rely on Coley’s professionalism and expertise. Coley told every customer that came by to let him know if anything was less than satisfactory with their package or nuc and if it wasn’t he would make it right. So here we go again! 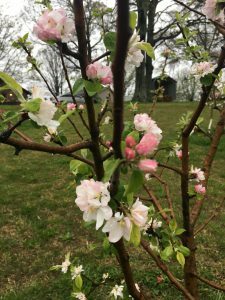 Another springtime in the year of beekeeping is off to a cold but steady start. Even though the weather is dreary today, they’re looking ahead at Smokey Ridge and recommend we are ready for swarms. Despite what many people say, Coley says swarm traps don’t have to be that high off the ground, just an empty hive body on a barrel with some drawn comb and a little bit of honey should catch a swarm if one goes by. A few drops of lemon grass oil or Bee Charm may help to create a habitat that a passing swarm may find irresistible. So even if you can’t imagine a swarm of bees flying through the cold rain this weekend, it is time to be ready to catch a swarm because, like Coley and Judy, your bees are definitely looking ahead.